On a typical Sunday afternoon today, Wellington’s Cuba Mall is bustling with shoppers, café and bar patrons, young people hanging out, and street performers. But in 1979, before the days of Sunday shopping and inner-city apartments, it was a different story: the whole centre of the city was largely a ghost town. 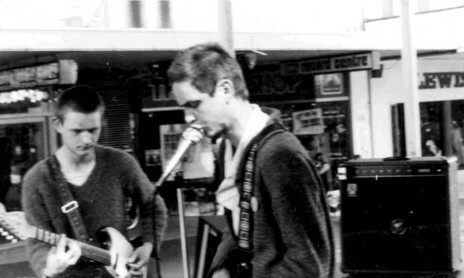 Back then, the still-small Wellington punk and post-punk scene struggled to find places where bands could play. Established venues such as pubs didn’t want to know, so it became a case of hiring halls and putting on your own gigs – if you could afford to. 4 November 1979: David Maclennan, the author, at centre. 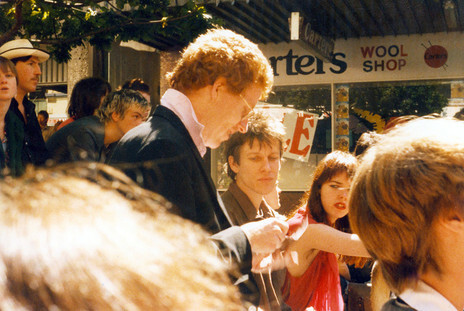 Toy Love’s Paul Kean and Jane Walker to his right, The Terrorways’ Chris Orange partially obscured behind him. "Fine weather and a good turnout made this one of the better Cuba Mall sessions." Frustration at the limited opportunities for the new bands to play live led members of two bands, The Spies and Wallsockets, to approach the city council, on behalf of both the musicians and their potential audience, seeking permission to use Cuba Mall (which had a small built-in stage complete with power source) for free performances. Somewhat surprisingly, the council agreed. 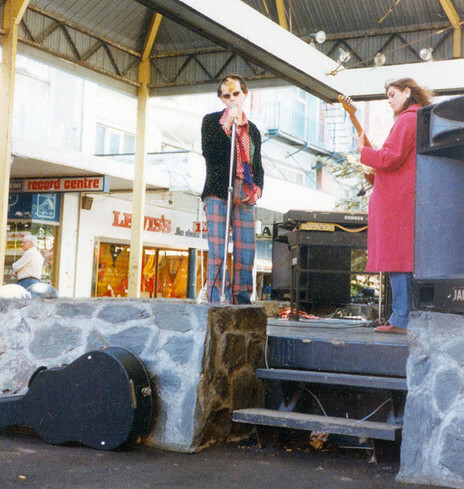 As much open-air band practices as they were actual performances, the importance of the Cuba Mall sessions, which were held most Sunday afternoons from 30 September to 9 December 1979, cannot be underestimated. For the first time the bands had somewhere regular to play, and it was a way of growing up in public. As the events tended to feature the same bands each time for the most part – mainly The Spies, Wallsockets, and the embryonic Shoes This High, but sometimes there were others – you could follow their development from week to week. Equipment was shared, and occasionally they might get the use of Toy Love’s PA if they were in town on a given weekend (as they were for the first one). 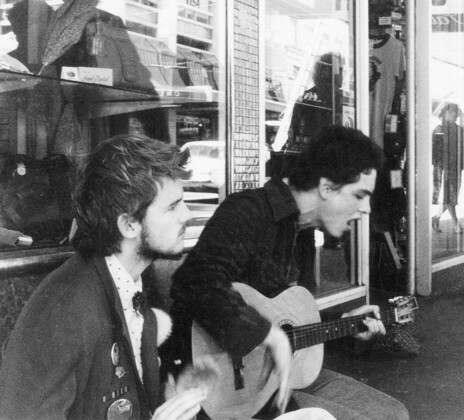 A typical Cuba Mall session would include sets from one or more bands, after which things usually degenerated into a lot of jamming. The first session was on 30 September 1979, a freezing cold day. On the exposed stage were featured Wallsockets, The Spies, and Industrial House Plans and Specifications Anti-Music Combo (essentially a solo project of Kevin Hawkins, which would soon evolve into Shoes This High). They had all played the previous night up the road at Thistle Hall, at a self-promoted gig which also featured The Ambitious Vegetables. The Ambitious Vegetables themselves played Cuba Mall the following Sunday, 7 October, but I missed them and don’t recall much else about the day. The next one I went to was on 21 October, when only two bands played, one of which was The Lunks, the successor to Kevin Hawkins’s Industrial House Plans and Specifications. Comprising Hawkins (guitar), Tristan Carkeek (bass), Andrew Strang (vocals) and a drummer named Wayne, The Lunks only lasted about a month or so before evolving into the first line-up of Shoes This High. A highlight of the afternoon was an impromptu one-song reunion by former Wellington art-rockers 52, featuring the original guitarist and a stand-in drummer. It was a pretty loose scene that day, with various people getting up on the stage at times and joining in or just having a loose jam. A girl I knew attempted to play keyboards with The Lunks at one point, and later there was her on bass, myself on guitar, and I can’t remember who else, trying to play something but none of us knew what anyone else was doing … Such was the spirit of those afternoons. For the next Cuba Mall session, on 28 October, I only got there in time for the last part of what sounded like a very good set from The Spies. By all accounts Wallsockets had also played well, and there were one or two other bands too (probably including The Lunks). After The Spies’ set, the afternoon turned into another general jam session. Toy Love and The Terrorways from Auckland were back in town for two shows at the Rock Theatre on 2-3 November, and both turned up at the next day’s Cuba Mall gig, along with a few of the Auckland bootboys, including Proud Scum singer Jonathan Jamrag, who came down with The Terrorways. Fine weather and a good turnout made this one of the better Cuba Mall sessions. The Terrorways played a set, as did Toy Love, but they were minus guitarist Alec Bathgate, who had already left town, so it wasn’t their best performance. Some local bands also played, but I don’t recall just who, and the afternoon’s music concluded with a set from Graham Sinclair (ex-52) on synth and my flatmate Bruce McIntosh on electric mandolin, but they were a bit untogether, and it was perhaps a bit too cerebral for that particular audience. Some amusing impromptu vocal contributions from Jonathan Jamrag lightened the tone somewhat. 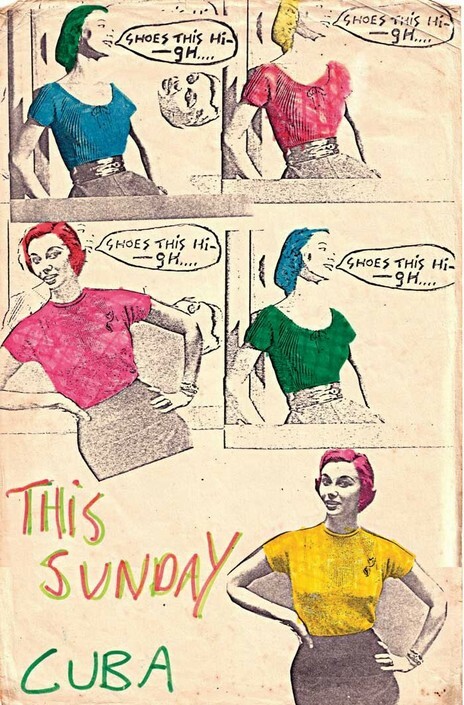 On 18 November there was only one band playing, Shoes This High, making what was probably their first public appearance under that name. Tristan Carkeek had left The Lunks, and Jessica Walker, who had played with an earlier incarnation of the band when they were called Jellyfish, was back on bass. The band’s new name also came from her. Shoes This High gave a good performance that afternoon, but their line-up problems were not over yet. 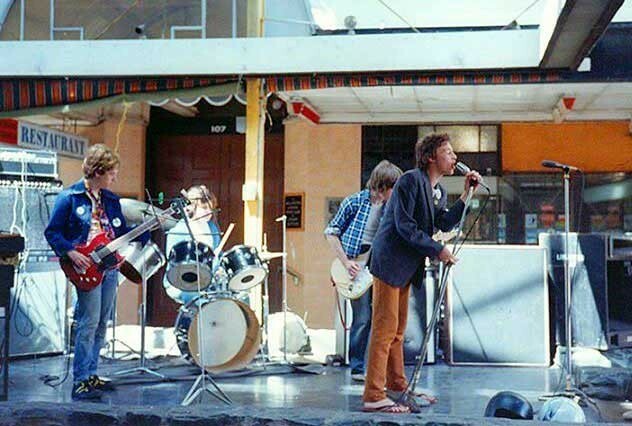 By the time of the final Cuba Mall session on 9 December, they had undergone another lineup change: Andrew Strang was out, and Brent Hayward, who had been in the Amps with Hawkins a year earlier, was now in the band. They played two sets that day. The first was rather lacklustre, but the second set, which finished the afternoon, was a killer, one of those spine-tingling performances that leave you with a sense that something really special is happening. Hayward performed like a man possessed, and it was clear that Shoes This High were going to be the band to watch in the coming year. Between Shoes This High’s two sets Graham Sinclair and Bruce McIntosh played another of their synth/electric mandolin sets, and they performed well this time. Then followed a rather uninspired set from the Spies: they just didn’t seem to be into it that afternoon (it would be a very different story the next time they played in public a week or so later, when they did a three-night stand at Willy’s Wine Cellar). With Shoes This High’s second set that afternoon, the Cuba Mall sessions came to an end. 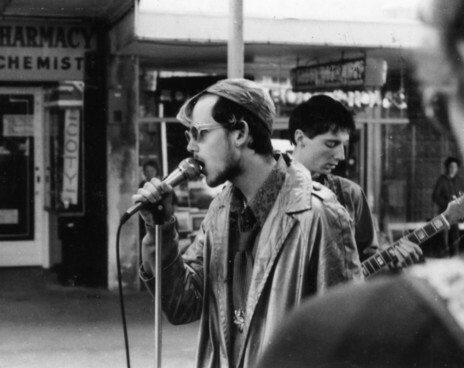 They had served as an incubator for the growing Wellington scene, and the following year would witness the fruits of that as bands like Wallsockets and Shoes This High went from strength to strength in their songwriting and performances. An attempt was made to revive the Cuba Mall gigs in August 1980, and while the first couple went off well, it didn’t last long. The time of year – mid-winter – may have been a factor, but in truth, things had moved on. The action was now at the former Rock Theatre, on nearly Vivian St; the venue’s new name was Billy the Club.